In 10-inch skillet, cook bacon over medium heat, stirring occasionally, until bacon is crisp; drain on paper towels. Meanwhile, gently scrub potatoes, but do not peel. Pierce potatoes to allow steam to escape. Place on microwavable paper towels. Arrange in spoke pattern with narrow ends in center. Microwave 12 to 14 minutes, turning once, until tender. Cover; let stand 5 minutes. When potatoes are cool enough to handle, cut lengthwise in halves; carefully scoop out pulp, leaving 1/4-inch shells. Save potato pulp for another use. In small bowl, mix oil, salt, garlic powder, paprika, cheese and pepper. Brush mixture over skins. In deep fryer or 3-quart heavy saucepan, heat oil to 365ºF. Fry in batches for 5 minutes. Drain on paper towels. (Make Ahead tip: Potatoes can be prepared up to this point and refrigerated for up to 24 hours before continuing to next step. One hour before serving allow potatoes to come to room temperature. Heat oven to 450ºF. Lightly spray 13x9-inch (3 quart) glass baking dish. Place potato skins, skin side up, in baking dish. Bake 8 minutes. 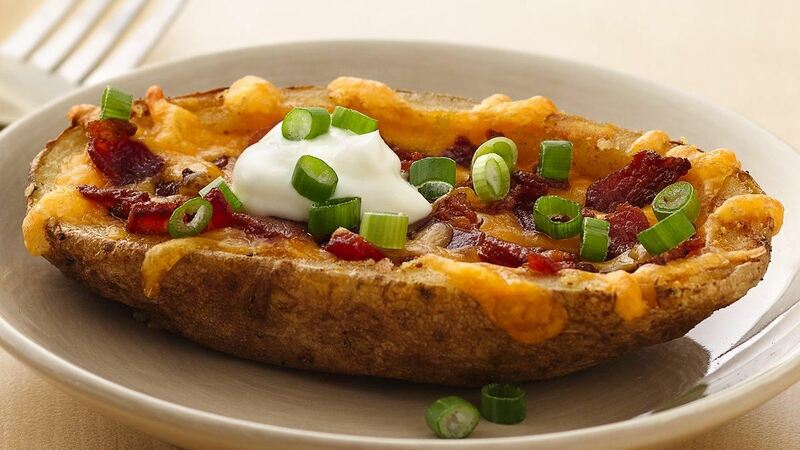 Turn potato skins over and fill with cheese and bacon. Bake 7 to 8 minutes or until cheese is melted. Top with sour cream and green onions. Bake instead of Fry: Instead of frying the potatoes skins (in step 5) try baking, by heating oven to 475°F. Place skins in lightly greased 13x9-inch (3-quart) glass baking dish; bake 8 minutes per side. Turn potato skins over and fill with cheese and bacon. Bake 7 minutes or until cheese is melted. Top with sour cream and green onions. Tip: Serve reserved cooked potatoes for a side dish topped with butter, salt and pepper.